The race of Dragon Boats form an important tradition of the Chinese Dragon Boat Festival and takes place annually in over 50 countries and territories around the world. Beautifully built, the Dragon Boats are wonderful specimens of Chinese artistry and an integral part of Chinese festive seafaring. Know all about Dragon Boats. If you want to have your friends enlighten themselves with this article, click here and pass on this page to them. Happy "Duan Wu" to you! You must have heard about the famous Dragon Boat Festival in China? An annual occasion in the country, it is marked by exuberant festivities that include, among other things, an annual race of dragon boats. But what are these dragon boats? Boats shaped like dragons? Well, YES and NO. 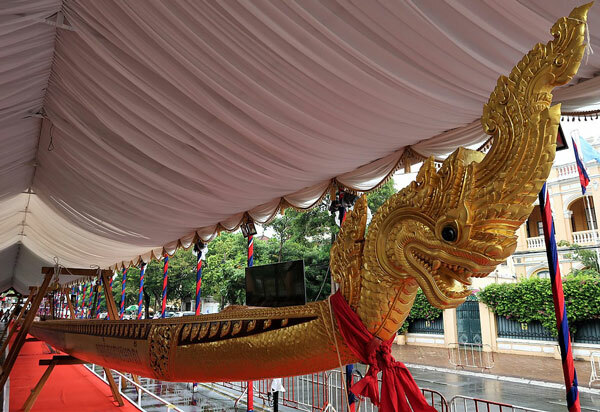 The famed "Dragon Boats" are nothing but very long and narrow boats with images of dragon heads painted onto their prows. Often, an open-mouthed wooden dragon head shape is stuck at the bow. A scaly tail (symbolizing a dragon tail) and a banner hoisted on a pole are fastened at the stern of the boat. The hull is decorated with red, green and blue scales edged in gold. These boats are rowed manually. Normally, a dragon boat is anywhere between 50 to 100 ft long, with a beam of about 5.5 feet, allowing two paddlers to sit side by side. In the center of the boat is a canopied shrine. Behind this sit drummers, gong beaters and cymbal players to produce encouraging music for the paddlers. A drummer and flag-catcher stand at the front of the boat. There are also men positioned at the bow to set off firecrackers and toss rice into the water – rituals integral to the boat race. All the noise and ceremonious festivities serve to create an atmosphere of gaiety and excitement for the participants and spectators alike. The "Dragon Boats” are rowed manually and mainly used in "Duan Wu", the annual boat racing competition during the Chinese "Duan Wu Jie" Festival. In the Western nations, the occasion is better known as the Dragon Boat Festival, named so by the Europeans who saw this annual racing ritual in the 19th century. During "Duan Wu Jie", boat races are held among different clans, villages and organizations, and the winners are awarded medals, banners, and jugs of wine and festive meals. A typical dragon boat has about 22 crew members, comprising 20 paddlers in pairs facing toward the bow of the boat, 1 drummer (or caller) seated at the bow facing the paddlers, and 1 steersman or tiller (helm) at the rear of the boat. However, it is common to have just 18 paddlers for races. A maximum of 80 rowers can be placed in a dragon boat, depending on its length. As dragon boats vary in length, the number of its crew members can vary. While small dragon boats have only 10 paddlers, massive traditional boats can have over 50 paddlers plus drummer and steersman. Traditional dragon boats with 40 to 50 paddlers are so long that the drum is placed in its centre so that all paddlers can hear it amidst the cacophony of the competition. For the smaller dragon boats, however, only 20 paddlers are used and the drum is located just after the dragon headed prow. Sometimes a gong striker, who strikes a ceremonial gong mounted aboard the boat, is used as an alternative to a drummer.